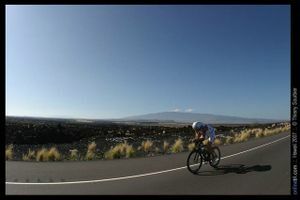 Pro triathlete, Chris Lieto, recently started a campaign called The Green Athlete. The Green Athlete provides resources and ideas that support athletes in their effort to live green. The Green Athlete campaign encourages athletes of all levels and abilities who lead busy lives and want to make small changes that add up to big results. A core component of the campaign, The Green Athlete Blog, provides weekly tips that cover everything from where to recycle your running shoes to what food choices will help make a difference. We hope to bring together athletes of all levels and abilities to make proactive environmentally friendly choices and changes, a part of their athletic lifestyle! I recently had a chance to pull Chris away from his busy training schedule to ask him a few questions about The Green Athlete. Here is what he had to say. We know the basic idea of what The Green Athlete is all about. How did this come into being….was this an idea that you came up with? Yeah, I came up with the idea. I thought this would be a good way to do what I can to bring awareness and educate people on being more green. In the process I have learned a lot and have seen more things that I can do to lessen my impact. Before I started the project I was a bit wary of doing the Green Athlete because I am certainly not the perfect “green” person. But you have to start somewhere and just do the things that you can do. There is a learning curve as you get more involved in being green. Through the Green Athlete I have been learning more things that I can change and have changed my thought process as a result. For example when you go to the coffee shop. Sure, the cups they use are from recycled material and you can recycle the cup but the better option would be to bring your own coffee mug and forgo the paper cup altogether. Have you been a big supporter of recycling, composting, basically being “green” even before now? I have always recycled and have learned since starting the Green Athlete that it is more about reusing and reducing instead of recycling…..which should be the last option of the three. For example I don’t buy bottled water. I use a filter on the tap instead. I am trying to get my sponsors to think along these lines as well, which many of them have already been doing. My sponsor BASE Performance Nutrition has a product that comes in concentrate form and it makes 8 gallons when mixed with water. So, rather than buying a bottled drink I can just mix it up using my water bottles, filtered water from the tap and the concentrate. So you’re driving around to races in a bio diesel and solar powered van? How is that? Do you have problems finding places to fuel up? It has been great. We are pretty much self sufficient in the van. We have a kitchen, fridge, microwave and of course a flat screen TV with a Sony Playstation III. I don’t have much of a problem finding a place to get biodiesel. There are websites that list stations that have biodiesel. So before I take a trip, I just have to map out where we are able to fuel up. We drove up to Boise for the 70.3 race there and we were able to fill up in Truckee and then again once we got to Boise. The van will run on diesel if I run out of biodiesel. Of course that is certainly not something I want to do and would rather run 100% on biodiesel. But, like I said I’m not the perfect green person and if I am able to use biodiesel 80-90% of the time then I am still making a difference. **Chris will have his van set up at the Vineman Ironman 70.3 expo on July 19th so stop by and say hi and check out the van! What kind of changes have you made when you go to races? Well the van is equipped with a water filter so I don’t have to buy bottled water. I also bring gel flasks and use those during a race instead of gel packets. I don’t take anything from the bike aid stations because I make sure I have everything I need with me. This helps reduce the garbage out on the race course. As I mentioned before the van has everything we need so that really helps. I think it’s not enough that races themselves are going green. We, as athlete’s need to do our part at races that are green to help them in their efforts. What other kind of changes have you made at home or in your daily life? What has been the reception from athletes/spectators at races? It has been great. People have been asking lots of questions. They have said that they really like the name (the Green Athlete). There have been some pros that have stated an interest in The Green Athlete. We’d like to be able to have them do some blog entries on the website to tell people what they are doing to be green and give some ideas that they have and changes they have made. We’ve got an idea where we can have people sign a pledge of some kind to get them more committed to making changes. Now that it is the height of race season I don’t have a lot of time to work on the campaign and website and expand on it but I hope to do more down the road. We just started on this project so I’m not sure what direction it will take but so far we’ve had good response to it. Are you finding a lot of racing coming on board with green initiatives like Vineman is doing and like Barry Siff has done with 5430 in Boulder? Yes. In just this race season I have seen a lot of races making changes. WTC is getting on board and North America Sports has voiced some interest as well. You’re involved with a program called Soles for Souls. Tell me a little bit about this. And, you have a link on your website for people to find out more about this right? Soles for Souls collects and donates used shoes to people in need all around the globe from victims of hurricane Katrina to those of the tsunami in Myanmar. If the shoes that they collect are no longer wearable the shoes are then ground up and turned into turf and material for playgrounds. We have been collecting shoes at various races (and will collect shoes at Vineman Ironman 70.3). The Green Athlete has teamed up with K Swiss and when someone donates a pair of shoes we’ll give them a discount coupon for a pair of K Swiss shoes. Well, Vineman will certainly get the word out about Soles for Souls and encourage athletes to bring their old running shoes to our race expo on July 19. Thanks Chris for taking some time out to have a chat about The Green Athlete! We’ll see you in a couple of weeks at Vineman where you’ll be taking part not only in the race on the 20th but also the Athlete Welcome Reception on July 18th at 7pm and at the expo on July 19th. Best of luck with the campaign and with the rest of your 2008 race season. REUSE is the second of the 3 R's. I talked a little about Reduce and now about Reuse. It is all first about Reducing what we use, then reusing what you can to eliminate more waste and last will be recycle. 1. Take along washable cups or travel mugs instead of disposables; a lot of restaurants and convenient stores will be glad to fill or refill your own mug. When you hit Starbucks everyday try to not use a new cup that ends up in the garbage, bring your own mug each day. That little step if everyone did it would save an enormous amount of trash. 2. When you do use disposables like plastic cups, plates, utensils, and plastic food storage bags, don't throw them away! Wash and reuse them -- most of them will last for a long time with many uses. They may not cost much to replace, but it doesn't make any more sense to throw away those things than it does to throw away your bicycle after one use. 3. When you do decide to replace something large and "reusable", be sure to donate the old one to charitable outlets like Goodwill, Salvation Army, Habitat for Humanity, Vietnam Veterans, and the many others that are probably in your area. Most of the time the item can be repaired by those groups, and then redistributed into other homes rather than landfills. 5. When you go to the grocery store bring your own bags. There is no sense in using the plastic or paper bags they supply there. Bring your own cloth bags that you can use over and over again. These are just a couple simple and easy ways you can make a big difference. When you really think about it these things would not take much effort or energy out of your day, but can save a lot of waste to our environment. Recycling Car Batteries: It adds up! Unfortunately, our daily activities contribute to climate change. Greenhouse gases (such as carbon dioxide) blanket the earth and warm the planet. Virtually any time we utilize a conventional source of energy or drive our cars, we are contributing to this warming effect and affecting climate changes. Your "carbon footprint" is a measure of your impact on the environment, in terms of the carbon dioxide emitted as a result of your daily activity. Use the calculator on this site to see how you measure up. Trying to be a "Green Athlete" for me is about doing my best to limit what I use. The saying goes: "Reduce, Reuse, Recycle" it is not the other way around. The first thing we need to look at as athletes is how can we REDUCE the damage we do or REDUCE the amount of stuff we use or throw away. One simple way that I have been doing is with bottled water. Instead of buying all those small bottles of water from the store buy the gallon or 5 gallon water jugs and just fill a bunch of small bottles for each day. Or even better than that why not save your money and just buy a filter for your tap water. Most tap water is descent and just needs to be filtered with a Brita or PUR filter and it is as clean as the water you buy in the store. They are relatively cheap you can help REDUCE the amount of empty plastic bottles that are filling up our landfills. Start by doing some of the simple easy things and don't worry about being the perfect "green" person. If everyone one did something little it would make a big change. Most of us have a collection of race day photos and are definitely into displaying the most recent one. I just found a photo frame made out of a recycled bicycle chain. Way to go! Christmas time has passed and you are left with the mess. Luckily for everyone, there are a lot of resources around to help you dispose of your Christmas waste most properly. Perhaps, the most universal element the Christmas tree (hopefully real, local, and organic) can be disposed of in many different ways. Depending on your living situation, there are a few great ways to re-use your Christmas tree. If you have a wood chipper, Christmas trees make great mulch for landscaping, gardening, and compost. Or, allow a few weeks for your Christmas tree to dry out, it’ll make great firewood. Surprisingly, Christmas trees make great habitats for fish. If you have a pond or stream on your property, toss it in. The fish will find it and thrive. Also, many local conservation groups would be happy to take that tree off your hands. They’ll know where it can best be used. Still, don’t get too excited. You shouldn’t just throw that tree into any public waterway. If you do have land, you should always consider allowing it to decompose in some corner of your property. Allow nature to take hold. You might also want to consider adorning the tree with bird food (strung cranberries, pine cones covered in peanut butter and bird seed, etc.) from branches. You should, of course, leave the tree in its stand for this option. This is one of my favorite options, because it moves the holiday season forward without the abrupt end that is too often felt. Plus, you can still do all the other options for re-use later. It might be a good way to let that tree dry out a bit before it goes toward a cozy fire. Oh, and be sure to take off all the ornaments and lights before you turn that tree into mulch, firewood, a marine habitat, or recycle it. If you do wish to recycle it, don’t fret there are many options for that as well. However, depending upon where you are in the country, your options may very greatly. The best and easiest way to check the recycling program your municipality or local conservation group has in place is to hop on over to Earth 911. There you’ll not only find a fact sheet about Christmas tree production, but also a list of the top ways in which Christmas trees are recycled. Also, if you simply type in “Christmas tree” and your zip code in the Find A Recycling Center bar at the top of the page, Earth 911 will bring up a list of places to bring that tree. If you have a fake tree, keep on using that thing. In fact, you might as well put it into your will and pass down to your heirs. (Fake trees are made out of non-biodegradable plastics.) Or, maybe you can use for an art project.